Turning from this temple, a few steps brought us to the Forum of Pompeii. This business centre of the city was undergoing restoration at the time of the eruption, for it had been injured by an earthquake shock sixteen years before. 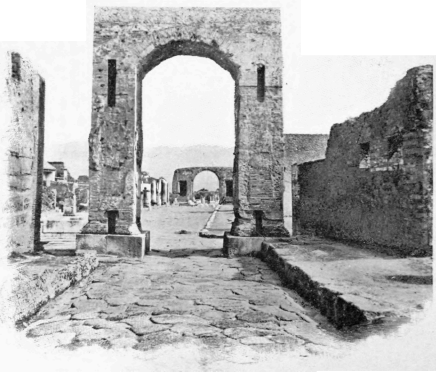 It should always be remembered that Pompeii was not at its best when the Vesuvian ashes buried it. Some of its public buildings had been utterly destroyed, and others partially ruined by the previous calamity. 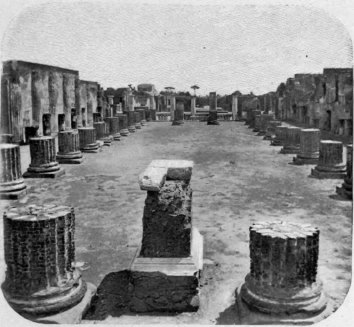 Thus, in this Forum, all the columns were still unfinished, and the pedestals were as yet without their statues. 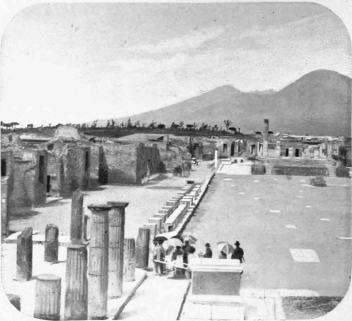 Moreover, in the period of its greatest prosperity, Pompeii was not a prominent city of the Roman Empire, but merely ranked among the third-class towns, since it had only thirty thousand inhabitants. 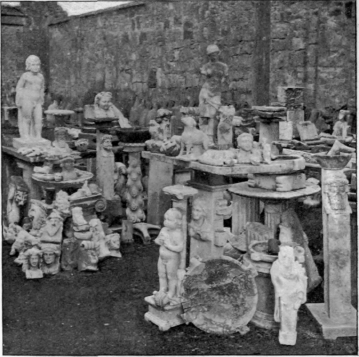 What, therefore, must have been the splendor of the larger Roman cities, when even this small town has revealed, in the mere fragment of it thus far brought to light, hundreds of bronze and marble statues, exquisite paintings and mosaics, two forums, eight temples, a court of justice, and two theatres, besides an amphi-theatre with a seating capacity for twenty thousand people! Its principal theatre is wonderfully well preserved, considering that it was completed long before the birth of Christ. Five thousand people could be seated here. 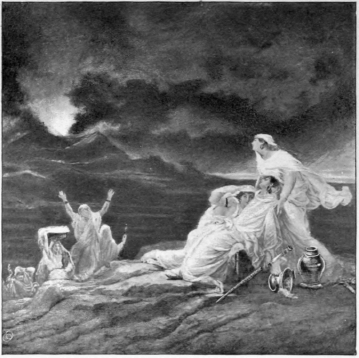 We visited with the greatest interest its orchestra and stage, observed the opening for the curtain, saw the dressing-rooms of the actors, and, finally, climbed to the highest story and touched the ancient rings which held the awning drawn between the assembled audience and the sun. 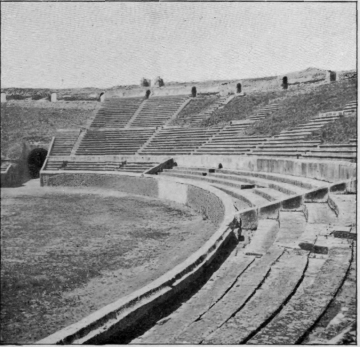 Among the seats of this theatre were found several of the numbered checks, which ushers used to take when they conducted people to their places. How near this building brings us to a life, which, so many centuries ago, craved entertainment and dramatic art as does our own, and found a means of satisfying this desire by methods not dissimilar. Dramatic and spectacular performances were, evidently, very popular in Pompeii. Upon the street walls have been found advertisements of entertainments in the theatres and the amphitheatre. One of them reads as follows: "Thirty pairs of gladiators will contend to-morrow at sunrise in the amphitheatre." 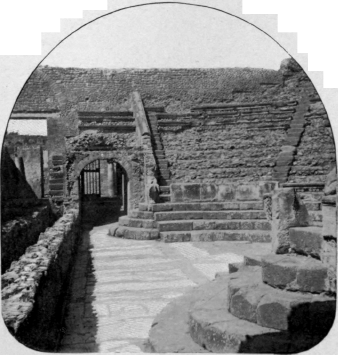 Another states: "A troop of gladiators will fight in Pompeii on the last day of June. There will be a hunt." When Roman managers prepared a "hunt," they planted trees in the arena to imitate a forest, and, on the appointed day, let loose among the trees two or three lions, half a dozen tigers, an elephant, a boa-constrictor, and a crocodile. 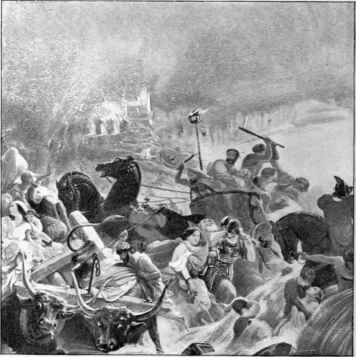 Ten men were then obliged to enter the "forest" and attack these animals. This was the kind of sport most dear to the old Roman world, for it was even more exciting than a gladiatorial fight. Every one knew how the latter must end. The wounded man would, of course, fall at last, with more or less grace, and receive the fatal blow; and it was usually understood between the gladiators that they would spare each other all unnecessary suffering. With wild beasts, however, nothing could be foretold. They would fight desperately to the last with tooth and claw. No graceful posturing was probable in those encounters. A wounded lion has no thought of the spectators. A maddened tiger shows no mercy. Accordingly, if a man here let his head swim, his hand fall, or his heart falter, he was instantly struck down and torn to pieces. Such scenes of bloodshed are too revolting to describe, yet from these very benches thousands beheld such sights, and these walls, which now will echo marvelously to the softest word, many a time resounded to roars of furious monsters and groans of dying men.